A financial lease is the other major type of lease. In contrast to the situation with an operating lease, the payments made under a financial lease (plus the anticipated residual, or salvage, value) are usually sufficient to fully cover the lessor's cost of purchasing the asset and pay the lessor a return on the investment. For this reason, a financial lease is sometimes said to be a fully amortized or full-payout lease, whereas an operating lease is said to be partially amortized. Financial leases are often called capital leases by the accountants. With a financial lease, the lessee (not the lessor) is usually responsible for insurance, maintenance, and taxes. It is also important to note that a financial lease generally cannot be canceled, at least not without a significant penalty. In other words, the lessee must make the lease payments or face possible legal action. Usually a shorter-term lease under which the lessor is responsible for insurance, taxes, and upkeep. May be cancelable by the lessee on short notice. Typically a longer-term, fully amortized lease under which the lessee is responsible for maintenance, taxes, and insurance. Usually not cancelable by the lessee without penalty. 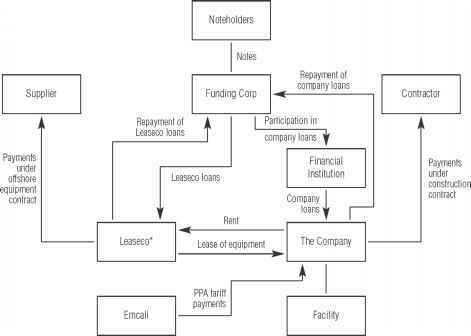 3In addition to arranging financing for asset users, captive finance companies (or subsidiaries) may purchase their parent company's products and provide debt or lease financing to the users. General Motors Acceptance Corporation (GMAC) and Caterpillar Financial are examples of captive finance companies. The characteristics of a financial lease, particularly the fact that it is fully amortized, make it very similar to debt financing, so the name is a sensible one. There are three types of financial leases that are of particular interest: tax-oriented leases, leveraged leases, and sale and leaseback agreements. We consider these next. A financial lease in which the lessor is the owner for tax purposes. Also called a true lease or a tax lease. Tax-Oriented Leases A lease in which the lessor is the owner of the leased asset for tax purposes is called a tax-oriented lease. Such leases are also called tax leases or true leases. In contrast, a conditional sales agreement lease is not a true lease. Here, the "lessee" is the owner for tax purposes. Conditional sales agreement leases are really just secured loans. The financial leases we discuss in this chapter are all tax leases. Tax-oriented leases make the most sense when the lessee is not in a position to use tax credits or depreciation deductions that come with owning the asset. By arranging for someone else to hold title, a tax lease passes these benefits on. The lessee can benefit because the lessor may return a portion of the tax benefits to the lessee in the form of lower lease costs. A financial lease in which the lessor borrows a substantial fraction of the cost of the leased asset on a nonrecourse basis. Leveraged Leases A leveraged lease is a tax-oriented lease in which the lessor borrows a substantial portion of the purchase price of the leased asset on a nonrecourse basis, meaning that if the lessee defaults on the lease payments, the lessor does not have to keep making the loan payments. Instead, the lender must proceed against the lessee to recover its investment. In contrast, with a single-investor lease, if the lessor borrows to purchase the asset, the lessor remains responsible for the loan payments regardless of whether or not the lessee makes the lease payments. A financial lease in which the lessee sells an asset to the lessor and then leases it back. 1. The lessee receives cash from the sale of the asset. 2. The lessee continues to use the asset. Often, with a sale and leaseback, the lessee may have the option to repurchase the leased asset at the end of the lease. An example of a sale and leaseback occurred in August of 2001 when the Malaysian government announced that it was setting up a company to buy aircraft owned by Malaysian Airlines and lease them back. The goal was to strengthen Malaysian Airlines' financial position by providing it with needed cash. In fact, sale and leaseback agreements often are arranged for this purpose.